We used to have a good thread promoting users game day pics on here. This is YOUR pictures, not anyone else's that you grab off the net somewhere. Now that everybody has a smartphone this should be even easier to do than before. Put pics of your tailgate of tailgate scene at your school, a pretty girls flying your school colors, a dude doing it as well if you have to, and any good pics of the game and stadium you can throw out to us. If you put some good ones up we'll take a few of the best ones and put em' up on twitter, our instagram, and maybe even on an article once in a while. At the very least we'll have a good thread full of FCS atmosphere around the country. What is this "game day" of which you speak? Jesus, I really gotta start looking at my posts a bit more closely before hitting submit. Actually, it wasn't a jab at your spelling/punctuation...I was just making a joke about the fact that this Saturday will mark 44 weeks since there has been a football game at Hanson Field (and still two more weeks to go). I think I've forgotten what a gameday is. Gotcha. I figure it will come right back to you at first chance. Here is a picture of my 2 youngest sons and I during the Mississippi Valley State at NDSU game. Last edited by dewey; September 15th, 2017 at 04:35 PM. 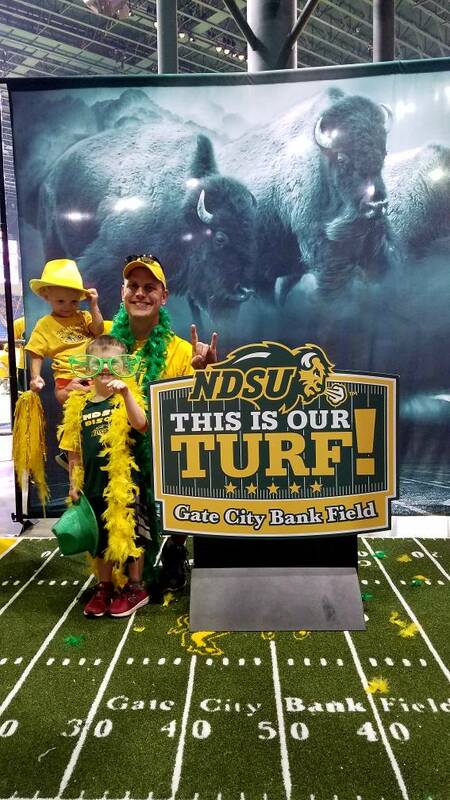 Proud supporter of the North Dakota State University Bison. Great pic man! Thanks dewester. How do we transfer pics to this site? Photo bucket is charging 299.00 now so what other options are available. Don't you just upload them like on a normal thread?